The Vienna Philharmonic Platinum 2016 is an essential buy for serious collectors as well as an exciting investment opportunity. Issued for the first time in 2016, this exceptional bullion coin is the latest in the renowned Vienna Philharmonic series. It is also the first platinum coin to be issued by the Austrian Mint since it was founded over 800 years ago. Buy Vienna Philharmonic Platinum 2016 as a safe have for capital or as a striking addition to your existing collection. This exceptional platinum coin was unveiled by the Austrian Mint at the Berlin Coin Fair and it is set to mirror the success of the mint's famous gold and silver Vienna Philharmonic coins. Why buy the Vienna Philharmonic 2016 Platinum? Each coin is made from .9995 purity platinum and bears the award-winning Austrian Philarmonic design that was created by Thomas Pesendorfer, the mint's head designer. Named for the world-famous orchestra, each coin features a selection of musical instruments on its reverse while the obverse shows an image of the Great Organ that stands in the Golden Hall at Vienna's famous Musikverein concert hall. 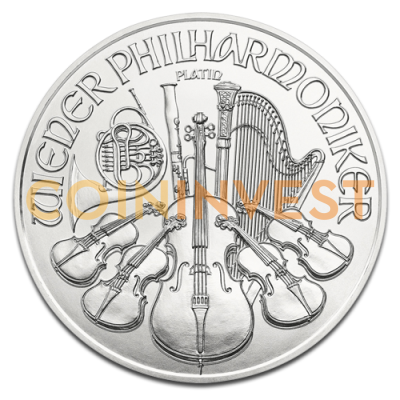 As a major distributor for some of the world's leading mints, CoinInvest.com is able to offer its customers unique coins like the Vienna Philharmonic Platinum at the lowest prices possible. Platinum coins, like gold and silver bullion coins, are considered a very safe investment and, as legal tender, they can be readily traded all over the world. All orders are securely packaged and insured and shipped quickly.